The demand within the global market for marine lubricants has been rising on account of the advent of advanced marine operations for a range of purposes, finds Transparency Market Research (TMR). 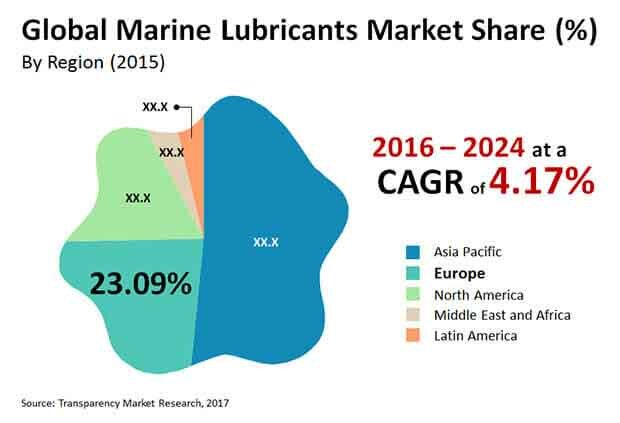 Several new and skilled market players have pervaded into the global market for marine lubricants and are contributing towards the fragmented nature of the competitive landscape. The marine lubricants market was previously characterised by the presence of a handful of specialist players whose integrity and market value was difficult challenge. However, with the exchange of key manufacturing technologies, the effective techniques for producing marine lubricants have also fallen under the hands of several new and emerging players. The large market players have been battling the continual entry of new market vendors, and the former are expected to resort to key marketing hacks in order to rejuvenate their iconic brand. Furthermore, the smaller market players are expected to concentrate on elevating their manufacturing standards to produce reliable and lasting products for the consumers. Strategic partnerships between small and medium-sized players in the global marine lubricants market are also underway. TMR projects that the competitive landscape of the global market for marine lubricants would be overhauled in the forthcoming years as a result of disruptions in the marketplace. Transparency Market Research (TMR) finds that the global market for marine lubricants would expand at a steady CAGR of 4.17% over the period between 2016 and 2024. It is also projected that the global marine lubricants market would touch a value of US$3.33 bn by 2024-end, rising up from a value of US$2.32 bn in 2016. On the basis of application, turbine oil segment is expected to attract the highest demand over the forthcoming years. Based on geography, the market for marine lubricants in Asia Pacific is witness a surge in demand over the forthcoming years. The growth of the global market for marine lubricants is catapulted by several factors including the need to prevent the various components of ships and marine vehicles from rusting. Furthermore, excessive friction can also render the marine vehicles obsolete and out-of-order which further necessitates the application of marine lubricants. The producers of base oil have also been increasing their net production volume, and this factor is expected to have a positive influence on the global market for marine lubricants. Furthermore, dissipating heat is another function performed by marine oil, and it is evident that excessive heating can be extremely harmful during marine operations. Owing to the aforementioned factors, it is safe to project that the demand for marine oil is driven by the need to enhance the operational efficiency of marine operations. Despite the progressive nature of the global market for marine lubricants, the demand within the global market could be restrained by several factors such as the availability of viable alternatives. Supplies of bright stock materials have been dwindling which has led to the discovery of several alternatives for marine lubricants. Furthermore, supply of low quality lubricants has resulted in several problems during marine operations which have in turn affected the integrity of the global marine lubricants market. Nevertheless, the expansive marine operations across the world are expected to keep bolstering demand within the global marine lubricants market. The review is based on TMR’s report titled “Marine Lubricants Market (Product Type - Mineral Oil, Synthetic Oil, and Bio-based Oil; Application - Engine Oil, Hydraulic Oil, Gear Oil, Turbine Oil, Heat Transfer Fluids (HTFs), Compressor Oil, and Grease; Operation - Inland and Offshore Operation) - Global Industry Analysis, Size, Share, Growth, Trends, and Forecast 2016 – 2024”.